Sandy Key's beaches are forever protected by the neighboring National Seashore Preserve. If you prefer your walks on the beach, solely in the company of the seagulls, Blue Herons and sea shells, then Sandy Key is the place for you. Sandy Key is located on 800 feet of Beach Front. This 3rd floor unit has 1219 SF of living area and a 200 SF beach front balcony. 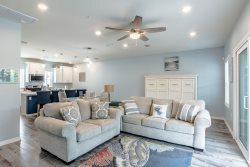 Carpeted living, dining, bedroom with tiled foyer, kitchen, hallway and baths..
We have used Perdido Realty on several occasions. Always satisfied with our service. Have referred others to Perdido realty. Everything and everyone was great!! I'll see you all next year. Thanks! My first time at Sandy Key. I just loved it. I hope to stay there again next year. Maybe even longer!! I found the team at Perdido Realtynto be very friendly, courteous and helpful. They were a pleasure to do business with! The property was excellent. Great location, amazing views, very clean and the most comfortable beds you will ever sleep in. We had a wonderful vacation. Sandy Key requires that all guest over the age of 6 wear arm bands for all property access including the beach. 8 arm bands will be issued for 3 bedroom units, and 6 arm bands will be issued for 2 bedroom units. Additional arm bands are not available.